1943 Carlos Haaland entered the Army August 1943. He was assigned to Camp Gruber, OK and the 42nd Rainbow Division, 222nd Infantry, 1st battalion, anti-tank platoon, HQ company. Carlos was one of the original "Rainbow men". He trained there until Mar 1944 when he was transferred as a replacement to Ft. George, MD and shipped overseas. 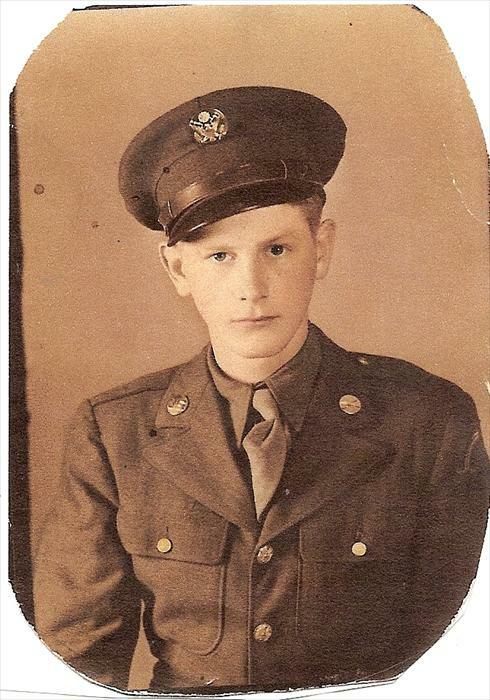 He was transferred to the 85th Division, 338th Infantry, 2nd BN, HQ Co. and deployed to Italy and the Gustav Line. The 338th infantry fought it's way "Up the Boot" of Italy. 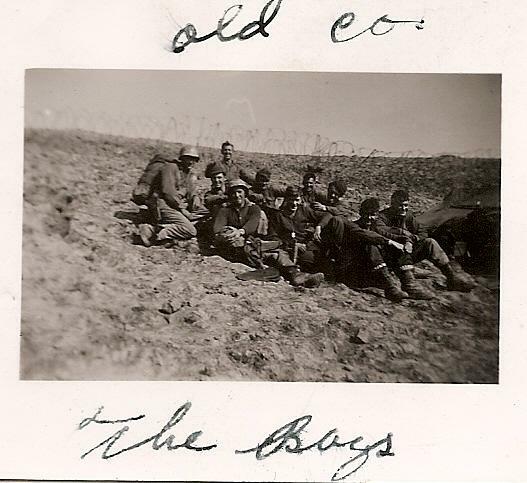 1944 The 338th, 2nd Battalion, was one of the first units to enter Rome 04 June 1944. Carlos and his regiment fought admirably in Rome-Arno, the North Apennines (Gothic Line), Mount Altuzzo, and Po Valley campaigns. They battled in 260 days of combat. 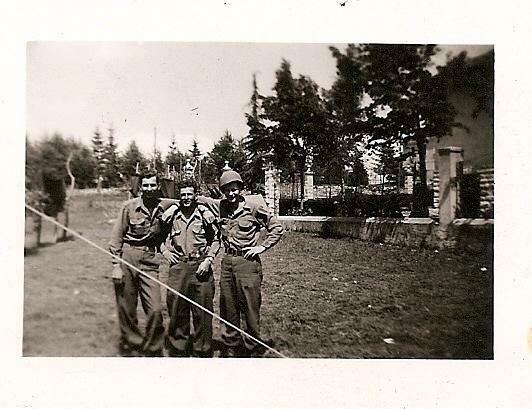 For their efforts, the 338th Infantry regiment was awarded a Presidential Unit Citation (one of only 5) in this division for their performance at Mount Altuzzo. It was here the 338th broke the back of German resistance, despite incurring heavy losses. They created an important breach of the Gothic Line giving the Fifth Army passage into the North Apennines. 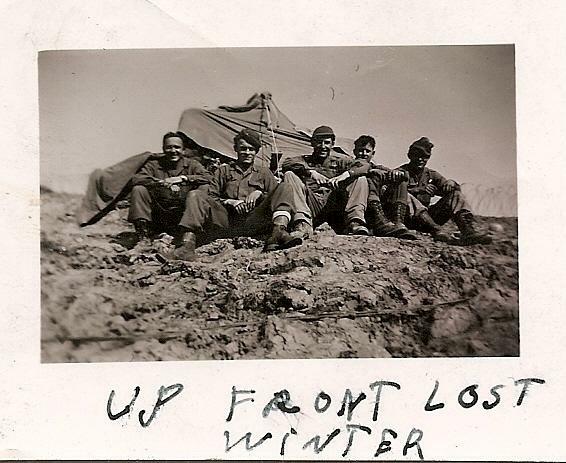 The 338th endured the long and brutal “Lost Winter” of 1944-45 in the Northern Apennines. American Fifth Army Commander, Mark Clark, considered the Custermen the elite assault troops in the Italian campaign. 9/18/1944 The Presidential Unit Citation reads as follows: “The 338th Infantry Regiment, 85th Infantry Division, is cited for outstanding performance of duty in action against the enemy from 13 to 18 September 1944 in overcoming the German defenses on Mount Altuzzo, the key point of the Gothic Line in the division sector. Spearheading the penetration of this formidable barrier, the 338th Infantry Regiment waged a bitter hill-to-hill struggle against an enemy stubbornly defending and counterattacking again and again. This hard-fought, grim, and bloody operation, culminating in capture of Mount Altuzzo, and the stern determination of the 338th Infantry Regiment to hold this objective against powerful and fanatical counterattacks were outstanding contributions to the break-through of the Gothic Line, setting the stage for the final defeat of the Axis forces in Italy. By its actions in gaining its vital objective against the bitterly resisting enemy, the 338th Infantry Regiment, 85th Infantry Division, displayed heroism, determination, and teamwork in keeping with the highest traditions of the Army of the United States.” General Orders, No. 9, Dept. of the Army, 21 Oct. 1947. 10/26/1944 An Extract from "The Stars and Stripes-Mediterranean." Oct. 26, 1944. WITH THE 5TH ARMY, Oct. 25--From bloody Solacciano Ridge and the Gustav Line, to Formia, the Gaeta Peninsula and Rome, and now the Gothic defenses in northern Italy--these are milestone to men of the 338th Infantry Regiment, just released as one of the units of the 85th "Custer" Division with Lt. Gen. Mark W. Clark's 5th Army. Their regimental motto is "Marchons"-Let us March! 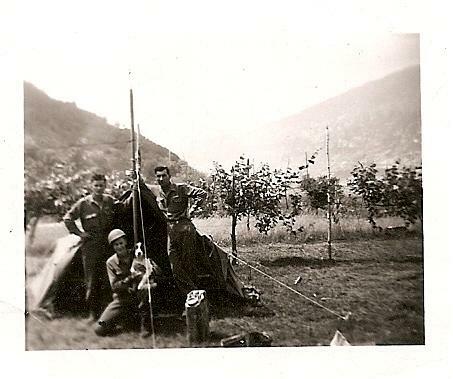 No one has marched through the mountainous Gothic Line, but the men of the 338th got through. The climbed and crawled and sometimes packed rations and ammo on their backs when the outfit's 150 mules could not get up to the half-mile peaks where the men were fighting. In the first four weeks of their drive the 338th helped breach the Germans main prepared defenses before the Po Valley, killing and wound many hundreds of the enemy. Throughout this period, units and individuals who distinguished themselves in the 338th's Rome drive last spring have turned up again int he stories of brave men and courageous action. When the 85th Division jumped off on Sept 13, with the vital Giogo Pass as its main objective, it was the 1st Battalion of the 338th, commanded by Lt. Col. Willis O Jackson of Atlanta, Ga., who led in the capture of Mount Altuzzo, key to the pass and one of the strongest points in the Gothic Line. GOOD DEFENSE Back at Solaccianno last May, Company I of the 338th, commanded by Capt Robert A Grubb of Oklahoma City, Okla., seized a strategic position int he Gustav Line and successfully defended it against a desperate German battalion for three days. In late September, Capt Grubb and his "I" gang almost duplicated their feat int he Gothic positions when they reached the battalion objective on Mount Zahobi-"The Rock"- above Firenzuola and held it alone all day against four Boche counterattacks, two of which were made with tanks. 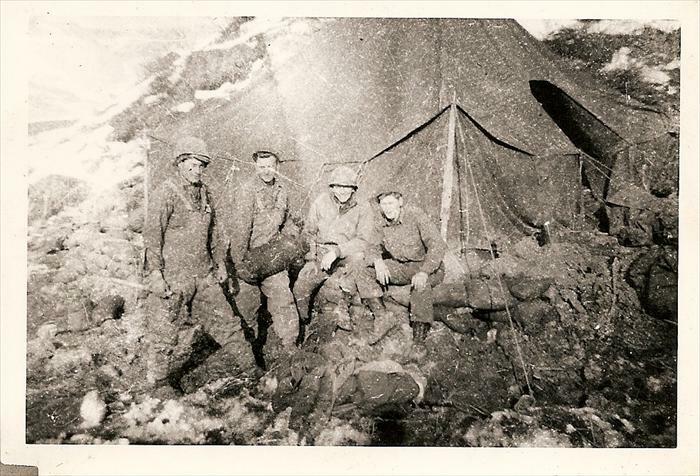 That night, however, they were forced to withdraw, although later the battalion got back on the 3000-foot mesa and stayed there. The 2nd Battalion, commanded by Lt. Col. Robert H. Cole of Gillette, Wyo., were matched against elements of the German's crack 4th Paratrooper Division and outfought them to get over Giogo Pass. This is the same outfit that pushed into Rome as "Task Force Cole", one of the first Allied units to enter the eternal city. 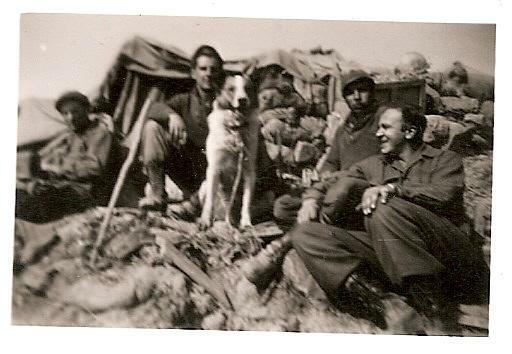 When a platoon of K Company lost all of its officers and many noncoms in fierce fighting at Mount Altuzzo, Sgt. A.W. Brown of Chattanooga, Tenn, took charge and personally wiped out an enemy machine gun, most with his tommy gun. Sgt. Brown had previously been awarded the DSC for action at Lariano last may when he attached three different enemy positions, killing six Krauts and capturing two others. MANY MEDALS All told, 338th men have won three DSCs, 35 Silver Stars, and over 200 Bronze Stars in their first half-year of action with the 5th Army. Activated at Camp Shelby, Mississippi, in May 1942, of men from nearly all of the eastern and southern states the 338th took part in the Louisiana and California desert maneuvers in 1943, and then sailed for North Africa, reaching Casablanca on Jan. 7, 1944. After intensive battle training near Oran, the 338th came to Italy with the 85th Division in late March. The regiment went into the lines for the first time in the Minturno sector on April 21. With the start of the spring offensive on May 11, the 338th jumped off at Solacciano and after three days of bitter fighting helped affect one of the first breaches in the Gustav Line. The regiment captured Formia on May 18; the 2nd and 3rd Battalions captured Mount Nero, last mountain barrier separating them from the Anzio beachhead force, while the 1st was making its amphibious hook. The entire unit advanced northward to capture Sezze and later relieved elements of the 3rd Division at Cori. The unit was relieved north of Rome. At this time, Col. William H. Mikkelsen, a West Pointer from Chicago, who had commanded the 3rd Battalion all the way into Rome, was made regimental commander. His old battalion is now commanded my Major Vernon A. Ostendorf of Walker, Minn. After a week in a defensive position near Empoli, below the Arno River, the regiment was reorganized for its drive to the Gothic Line. (by a Staff Correspondent) Vol.1, No. 108. Printed in Italy. Two Lire. 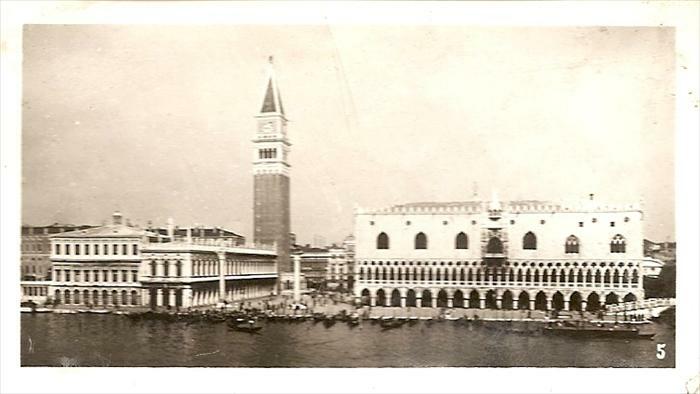 Unknown building in Venice, Italy. Possibly on return to Naples towards end of overseas service. 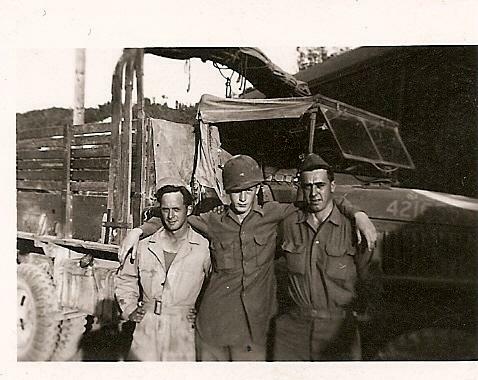 Carlos Haaland in center (dogtags), with his company in Italy at the front. 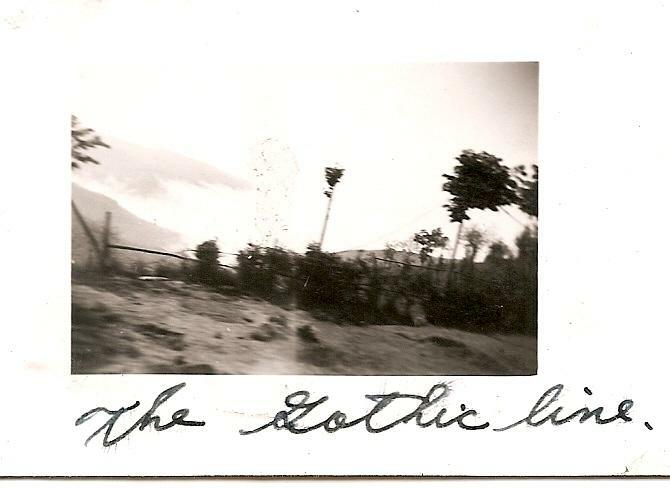 The Gothic Line, his handwriting. His combat brothers and another adopted dog. Carlos and his adopted dog. Carlos in Italy, he is on the right. The Lost Winter, Northern Appennines, Italy. Three men in Italy. Carlos is on the right. Carlos was sometimes assigned as a truck driver. This may be his truck, with Carlos in center. 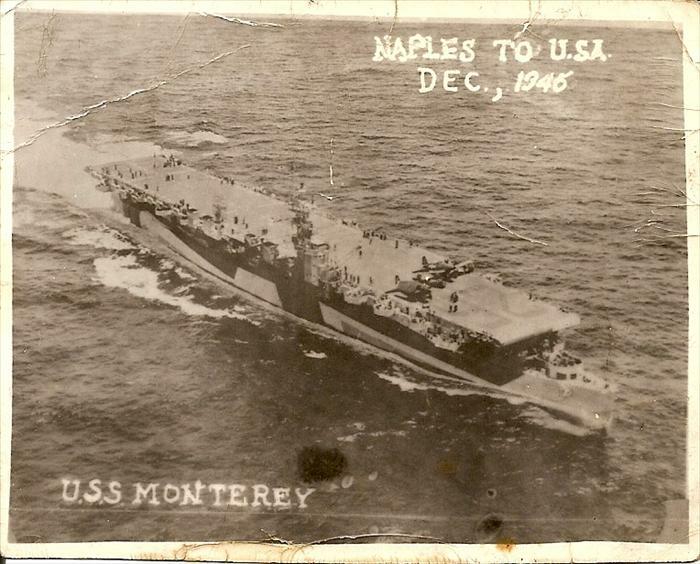 The USS Monterey., Naples, Italy to U.S., Dec. 1945. Carlos Haaland returns to the continental U.S. The girls at home, with the guys hats. 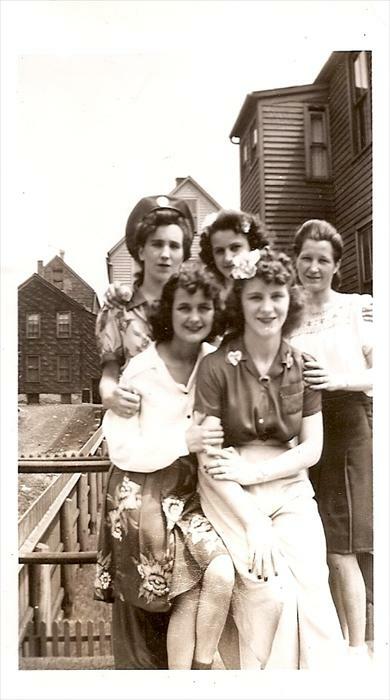 Top row: Cindy (sister-in law), Margie (his sister), Dottie (sister-in-law). Bottom row: Pat (his wife) and Joy (a family friend). Carlos O Haaland before overseas departure.